A “Grandfather” of Provo remembers the island’s first vehicle. Today, there are approximately 25,000 vehicles zipping along the network of roads and highways on the island of Providenciales, including personal, rented, corporate and utility vehicles. This stands in stark contrast to November 22, 1966 when there was only one. That was fifty years ago and Bengt Soderqvist, Managing Director of Provident Ltd., remembers it as if it were only yesterday. In October 1966, three men set out from Delray Beach, Florida on an adventurous journey to begin the project that would totally change the landscape of Providenciales and set it on the path to becoming one of the most acclaimed tourist destinations in the world. Their task was to begin the development of 4,000 acres of Crown Land as per a lease agreement with the Turks & Caicos Government. Called Provident Ltd., the company had a lease with the option to buy the land upon completion of the terms of the agreement. The requirements were formidable. At the time, Provo had little contact with the outside world. There were no docks or marinas, no airstrip, no roads and not even a single telephone. Starting from scratch, the developers had to construct a 4,500-foot crushed-coral-surfaced airstrip, roads to link the three original settlements of Blue Hills, The Bight, and Five Cays, a hotel with at least ten rooms(! ), a jetty at Five Cays, and a safe anchorage at Sellar’s Pond (now Turtle Cove Marina). Naturally, all this work created employment for many Islanders. With some changes and improvements to the original agreement, Provident delivered and was able to purchase the 4,000 acres of land in 1971. The rest, as they say, is history. To start the project Fritz Ludington, Tommy Coleman, and Bengt Soderqvist loaded a boat with every conceivable item of building materials and equipment that they would need, all too cognizant of the fact, according to Bengt, “that there was no Do It Center hardware store to go to.” Nor were there any vehicles—or even roads—on the island so they brought an old jeep to help them get around. The Seven Dwarfs during one of its voyages from Florida to Provo. The boat that made that inaugural journey was the Seven Dwarfs, the nickname by which the group of developers who owned Provident were known. The story of the origin of the name, as told by Bengt Soderqvist, is as follows, “One day early in the project during a meeting in Grand Turk between the group of developers and government officials, there was disagreement about something that required a brief recess by the government negotiators. In their absence Rogers Morton (one of the seven developers) asked ‘Who do these guys think they’re dealing with—The Seven Dwarfs? !’” After the laughter died down they decided they liked the sobriquet and it stuck with them even to this day. 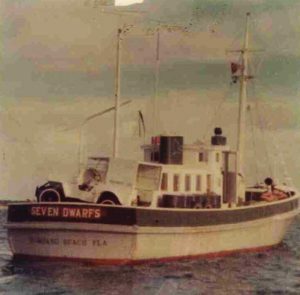 The boat Seven Dwarfs came to Providenciales after docking at South Caicos, because that is where the Customs Department was located. From there experienced seamen Gustavus Lightbourne (a member of the Legislative Assembly) and Charlie Rigby successfully navigated the boat to Wheeland on Provo where they anchored in front of Mr. Lightbourne’s house. The following day they went inside the reef to Leeward Going Through, passing “Done Bobbin’ Point,” so named because it was the point where the waters calmed and the boat stopped its bouncing motion. It is one of Bengt’s favorite name recollections and understandably so. They finally anchored in the Leeward Channel. The plan was to unload the boat at Heaving Down Rock. Although the channel itself is deep, at that time it was choked with conch shells and mud so they had to clear a path to shore by skillfully using the propeller of the boat. With the Seven Dwarfs safely moored, Tommy Coleman, Alfred Stubbs, and others from The Bight worked unloading on the dock while Bengt walked all the way to Turtle Cove surveying and clearing a path for the jeep to follow. 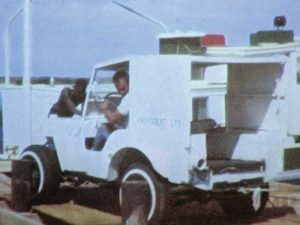 The first motor vehicle to “set tire” on Providenciales. On November 22, 1966 the jeep was finally driven off the boat onto Providenciales. Bengt said back then it took about one hour to drive from Heaving Down Rock to The Bight. When the jeep arrived it was quite a memorable occasion for all, especially for the many excited children who got to ride in a motor vehicle for the first time. 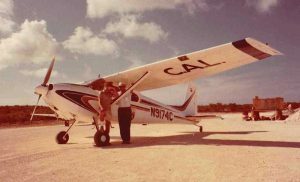 The first plane in the Caicos Airways fleet. Occasionally, as I drive along the network of roads here to get to wherever I need to be in mere minutes, Bengt’s recollections from fifty years ago come to mind. Then I pause to imagine a very different landscape and one lone, open Jeep lurching and bouncing along slowly following a cow path through the bush, and it gives me a greater appreciation for the landscape and the pioneers who blazed the trail.